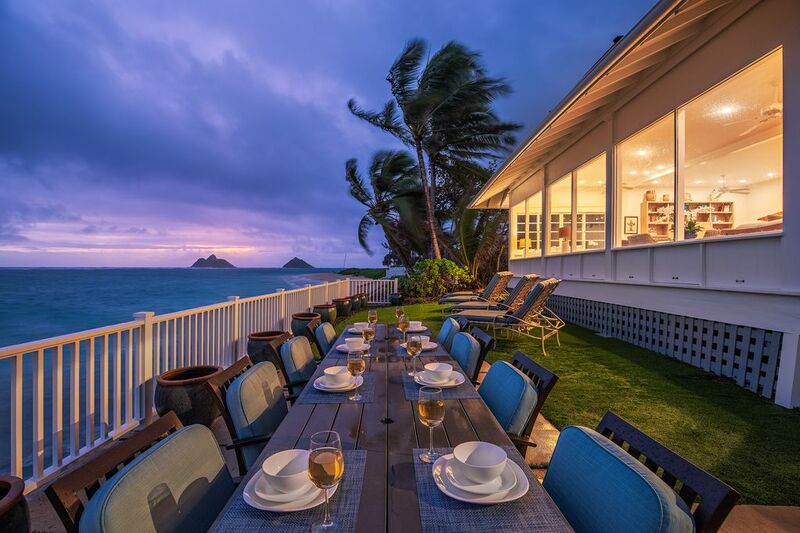 Welcome to Walker's Lanikai Beach House. John Walker, was a Scotsman who made his way to Hawaii as a young man in the 1870's to become a contractor of choice to Queen Liliuokalani, and erect such notable buildings as the Bishop Museum and Honolulu Hale (City Hall). Mr. Walker's inviting presence is felt in the structure of this, his favorite hideaway on Lanikai Beach. Built in 1934, this enchanting environment transports you back to an era of graceful living, where the worries of the world are lost in the luxury of sea, sand and restful surroundings. Following recent renovations, the house contains just the right combination of added comforts in its updated kitchen, guest quarters and “boat house”, with elements of charm carefully preserved from a richly felt past. One of the first homes to take advantage of Lanikai’s heavenly reef-protected waters and natural stretch of white sand beach, John Walker’s Beach House set the standard by which the surrounding community grew…a standard which has been nurtured by his family through the years for you to enjoy. Although only with us in spirit, John Walker’s love of Lanikai is preserved by one of his most revered places in the world. The main house features 3 bedrooms, kitchen and large "great room" with spacious guest rooms. Steps away is the white soft sands of Lanikai Beach with access to the water provided from the front lawn. With a separate entry, the 'guest cottage' located off the entry courtyard features a queen-bedded room and a small parlor with kitchenette (sleeps up to 4). Another private entry "boathouse" sits above the garage - complete with its own living room, kitchen, bathroom and lanai. The "boathouse" also has a loft area with double bed that may be suitable for young children (sleeps 2-4). This is the classic Lanikai Beach House - for those looking for a casual, relaxing getaway on the shores of one of the worlds' best beaches! Note: FEB 23 - 28, 2019 the "boathouse" will be occupied and unavailable to rental guests (separate unit). This property is a professionally-managed by Private Homes Hawaii, LLC and is licensed as a short term vacation rental. Non-Conforming Use Permit Number 90/TVU-0042 and is compliant with Hawaii State Legislation (HB2078) for vacation rental accommodations, Lic#TA-043-470-0288-01. A great property to share with family and friends! It has amazing amenities and easy beach access. You cannot beat the view! Thank you for your review and Happy Anniversary again, celebrating your 50 years! We hope to have you and family back again soon. The Walker house was wonderful. Beautifully decorated and cared for. I had the front bedrm and loved the sound of the waves at night. Everything we needed was there. A perfect spot to celebrate my 90th birthday with family. Wonderful memories. May be back for my 100th! Congratulations again on your 90th and absolutely... would love to have you back for you 100th! Gorgeous spacious vacation home!!! Actually it is a compound, with a three bedroom, two bath main house and a boat house and an additional cottage!! Perfectly suited for a large family vacation! The main house has a stunning view of the ocean!! It's like you are in the ocean!!! The outdoor patio has a 360 degree view of the ocean and beach! The beach is so calm! Probably one of the best beaches in Oahu! Perfectly suited for little kids and also snorkeling!! We had the time of our life at the Walker house!!! Highly recommend!! Thank you for your kind review and glad to hear you enjoyed the Walker House in Lanikai. Look forward to having you back soon! We visited Oahu as a family for the first time in 10 years, recalling memories of our parents and making new memories with the next generation! The Multiple living spaces both inside and our were delightful, and the yard a bonus for energetic grandchildren. We loved the views and ocean breezes, and the kitchen was great for family cooking. The lack of a fence on the ocean side made us a bit nervous for the two year old, bur we had no close calls. Our family of 9 spent a wonderful week during May, 2018 at the Walker Lanikai Beach House for our 50th wedding anniversary. Stephen was there when we arrived to show us around and with a gift of his delicious dessert. The large open living room facing the ocean was a marvelous setting. We enjoyed breakfast and dinner meals as a family around the large dining table. The beach was just minutes away for wonderful swimming (especially for the grandchildren). Daily hike from the house up to the pillbox was also a highlight. Highly recommended - would love to return. Thank you for your review and glad to hear you enjoyed the Walker House Lanikai. Look forward to having you back with us again soon. Amazingly beautiful view! Even on a rainy, windy day we felt we were at the beach and enjoyed watching kite boarders "fly" by. This was our second visit with our children and grandchildren and the 11 of us fit easily around the table and in the house/boathouse/cottage. The kitchen is fully stocked. Upgraded historic house. Steven answered any questions quickly and baked bread pudding for our arrival. Traveling to Hawaii is easier because so much is provided - beach toys, chairs, boogie boards, towels, umbrellas, games, shampoo etc. Outdoor warm showers with lower and upper heads were great for the children and adults. Grassy yard wonderful for children's soccer games. Lounge chairs by water great for sunrise and relaxing. Easy walk to the beach where our grandson was baptized by a local pastor who also baptized another grandson on our first visit. The whole place is just fantastic and we hope to return to make even more memories for us and the children! Thank you for sharing your experience with us and others around the internet! It was a pleasure to have you back again and glad to hear you continue to enjoy the Walker House. Awesome that your grandson was baptized nearby too - now, that's a great memory! Congratulations! from $1500/night for up to 14 guests, seasonally. Rates are subject to current tax, @ 14.962%. * Minimum Stay Seven (7) Nights w/some exceptions.